Our Anti-Valentine's Day Party is something everyone can sign up for, so what are you waiting for? 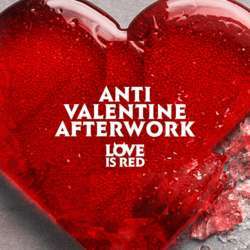 Spread the word and gather all your girl/boyfriends who are as over (Valentine’s Day) as you are, and set yourself up for madness, as we’ll be having the best afterwork party in town at the stylish Protected content near place lux, where our dj will be spinning empowering numbers from TLC, Beyonce and Destiny's Child. Spread the word among your friends and come to mix and mingle as a single - enjoy some food and unwind to the DJ beats. Just make sure your friends sign up for this activity through InterNations.